“Kamae is attitude” was written a few years ago, this is an updated version of it. Budo Taijutsu begins with the study of “kamae” or body posture. This first introduction to budô gives us a strong physical foundation, which allow us to grasp the true essence of natural body movement. Unfortunately with time passing, we seem to forget the value of training the basics in general and particularly the body postures. 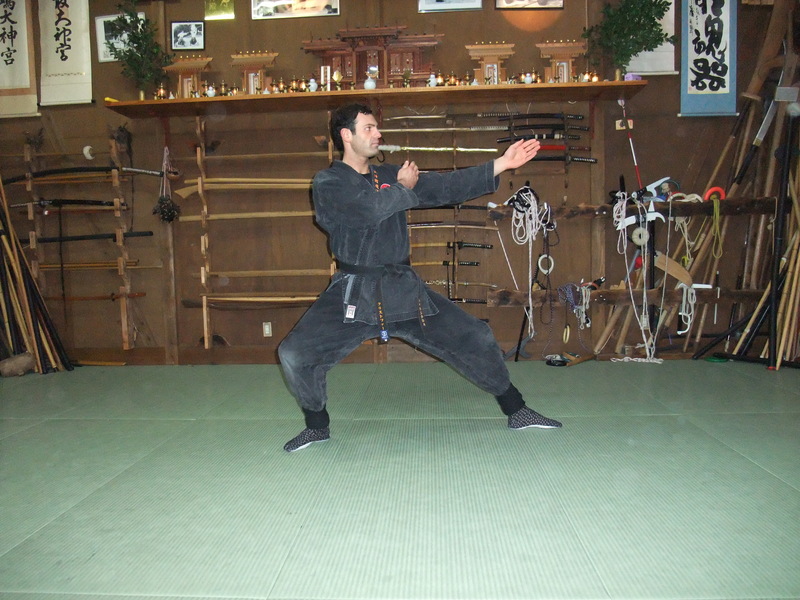 In each Bujinkan Ryûha there is a set of given kamae that is called kurai-dori. If we translate “kurai” and then “dori” the meaning is “about grabbing” and it looks that it is dealing only with the physical aspect of fight. But a good dictionary tells you that “kuraidori” in one word means “positional notation”, like the digits after the comma. This induces precision and it translates by “precise notes for postures”. It is a lot different from kurai + dori ! Even though the Ten Chi Jin ryaku no maki has a basic set of 9 kamae, each particular ryû has differences which depend upon the time where the kamae were created, and the evolution of warfare they had to adapt to. How do you “Ukemi” (receive, dodge, absorb) a bullet? So kamae is not only physical, the mind gives also value to the posture. “kamae” means posture or attitude, so apart from the “physical attitude” we now have to consider the “mental attitude”. This is why when teaching the basics we speak of “tai gamae” and “kokoro gamae“. The tai gamae is the body posture where the kokoro gamae is the mental attitude. If we broaden this understanding it can be also understood as our “attitude in life”. Having good kamae in the dôjô is nice nut it is even better to have a good kamae in life. This is our human attitude that makes us different. Having a good technical ability is not enough and from my perspective too many do not have a good attitude in life as human beings. If you thoroughly study your kamae on the mats they will change your attitude in life. When sensei says that our goal “in the Bujinkan is to create better human beings” he means that the study of the tai gamae will change your kokoro gamae, not only in the dôjô but also in life. Even though there is no spiritual teaching in the Bujinkan, no link to any religion or mystical system, Hatsumi sensei has created and transmitted a powerful tool to help us become true human beings (bujin). As always there is always more in the ura of things than the omote let you think there were.